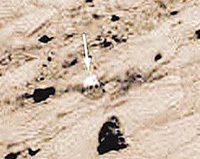 NASA’s Spirit rover took a number of pictures depicting weird objects on the surface of Mars. Michael Middleton of Australia, a photographer and a UFO spotter, found a skull on one of the pictures taken by Spirit. The original photograph is located on NASA’s official website on the following URL. Middleton zoomed in the photo and found a skull on the foreground. Indeed, a piece of rock on the Martian sand bears a striking resemblance to a human skull. It is a round object with eye sockets and a nose pit. The lower jaw is embedded in the sand. It is hard to believe that the natural world of Mars could make such a rock. Middleton said that the ‘skull’ stands out against the rest of the landscape that can be seen on the photograph. It is a white object, the color of a bone. Another object to the right of the while skull looks like someone’s head too, albeit it is not the shape of a human head. The grey rock has a small chin, there is no nose pit, whereas the eye sockets are oblong and disproportionately large. It looks like an alien skull. According to Middleton, it is boring to think that the discovered rocks are just rocks. Their surface is unusually smooth if compared to other rocks on the photo. It is also impossible to explain how the skull of a human being and of an alien found themselves resting next to each other on the mysterious red planet.